As we've seen many, many times throughout the years, Hollywood isn't exactly the best when it comes to keeping sexism and sexist attitudes far from the workplace. Here are 15 actresses who have called Hollywood out on its sexism. Jennifer Lawrence Back in 2015, Jennifer Lawrence wrote that higher pay for “the lucky people with dicks” needs to end in an essay for Lenny, Lena Dunham‘s feminist newsletter. “I’m over trying to the find the ‘adorable’ way to state my opinion and still be likable,” she wrote. “F--- that. I don’t think I’ve ever worked for a man in charge who spent time contemplating what angle he should use to have his voice heard. It’s just heard.” Read her full letter “Why Do I Make Less Than My Male Co-Stars?” here. 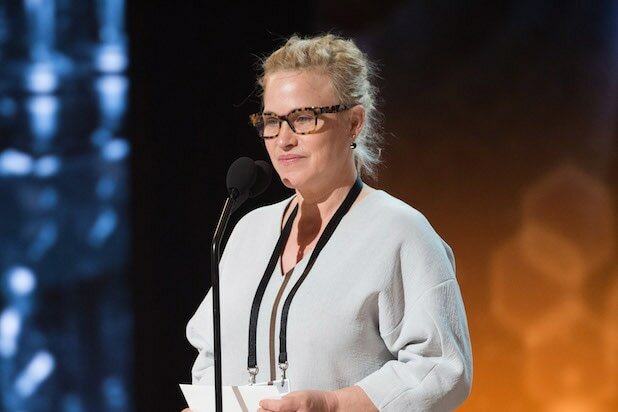 Patricia Arquette Patricia Arquette's acceptance speech for her first Oscar in 2015 served as a call to action for equal pay. "To every woman who gave birth to every taxpayer and citizen of this nation, we have fought for everybody else's equal rights. It's our time to have wage equality once and for all, and equal rights for women in the United States of America." Jamie Denbo "Orange is the New Black" star Jamie Denbo was told that she was too old to play the wife of a 57-year-old actor -- she was only 43 though. “I was just informed that at the age of 43, I am TOO OLD to play the wife of a 57 year old,” Denbo wrote to Twitter. “Oh, the characters also have an 18 year-old daughter. I am TOO OLD to be the mother of an 18 year-old.” The OITNB actress said that the actor had requested an age limit for his TV wife. "Old white men, enjoy your last run. We are all f---ing done with you lizards," she concluded. Helen Mirren Academy Award winning actress jumped to Maggie Gyllenhaal's defense at TheWrap's Power Women's Breakfast in 2015 and calling it “f---ing outrageous” that 37-year-old Maggie Gyllenhaal was recently told she was too old to play the lover of a 55-year-old man. “It’s ridiculous. And ’twas ever thus. We all watched James Bond as he got more and more geriatric, and his girlfriends got younger and younger. It’s so annoying,” she said. Jessica Lange "American Horror Story" star Jessica Lange spoke out on sexism and ageism in Hollywood in light of Maggie Gyllenhaal's comments and said that this isn't a new phenomenon. “Hollywood is run with this male point of view. Even if a woman runs a studio, she still does it with a male point of view. And as long as that exists, you’re still going to have this wish fulfillment,” Lange said during an interview with TheWrap Magazine. Mila Kunis Mila Kunis penned an open letter in A Plus detailing her experiences with sexism in the industry. "You'll never work in this town again." A cliché to be sure, but also what a producer threatened when I refused to pose semi-naked on the cover of a men's magazine to promote our film. I was no longer willing to subject myself to a naïve compromise that I had previously been willing to. 'I will never work in this town again?' I was livid, I felt objectified, and for the first time in my career I said 'no.' And guess what? The world didn't end." Read her full letter here. Kerry Washington During The Women of Sundance brunch this past year, Kerry Washington spoke out against people labeling casting black women leads as taking a "risk." She also added that she enjoys being behind the camera because she's able to include people that reflect what the real world looks like. "I love acting and I love my day job, I love it so very much, but becoming a producer, producing Confirmation and starting my own production company, I get to hire other women, people of color and people of the LGBTQ community," she said. "I want to make sure that people society has labeled as 'other' have a chance to be leaders, and to make the table look like what the real world looks like." Olivia Wilde In a 2014 panel, the "House" star said: "It’s really hard to get stories made that are about women — not just women being obsessed with men or supporting men. And it’s really hard to get men to be a part of films that are about women in a leading role." Mindy Kaling During an interview with Lena Dunham, "The Mindy Project" star pointed out that sometimes journalists ask sexist questions. More than half the questions I am asked are about the politics of the way I look. What it feels like to be not skinny/dark-skinned/a minority/not conventionally pretty/female/etc," she said. "It's not very interesting to me, but I know it's interesting to people reading an interview. Sometimes I get jealous of white male showrunners when 90 percent of their questions are about characters, story structure, creative inspiration, or, hell, even the business of getting a show on the air. Because as a result the interview of me reads like I'm interested only in talking about my outward appearance and the politics of being a minority and how I fit into Hollywood, blah blah blah. I want to shout, 'Those were the only questions they asked!'"